Early, child, and forced marriage are forms of gender-based violence that pose serious threats to the rights of girls and women. It is estimated globally that one in nine girls will marry before their fifteenth birthday, some as young as five years old. A number of religious leaders and communities advocate for the marriage of children, justifying it as driven by religious texts or other religious authoritative sources. 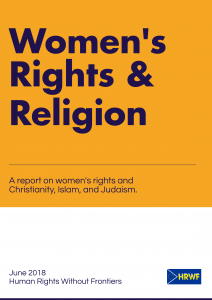 On the other hand, religious leaders and governments in some countries are also taking more positive steps to protect the rights of girls and women who become victims of child and forced marriages. 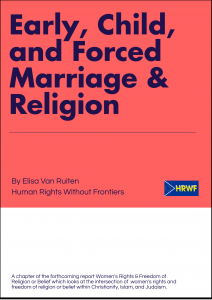 This paper looks at the issue of early, child and forced marriage as part of the research that HRWF is conducting on the intersection of Women’s Rights and Freedom of Religion or Belief with the aim of revealing the misconceptions about the intersection of the two rights and try to find a way forward, together.